The State Assembly's plan is to pass this bill on May 19, 2015. The Assembly Democrats introduced an omnibus bill renewing the state rent and coop laws and making numerous changes to both the state and NYC rent laws. The changes are pro-tenant, although some of the changes are not adequate. A7526 extends state rent control and the Emergency Tenant Protection Act of 1974 for four years, to June 15, 2019. It also extends the NYC and three-county coop conversion laws to the same sunset. 2019 is the worst possible sunset year in terms of leverage. 2019 is after the next two legislative elections, and after the next gubernatorial election. Our friends in the Assembly are for some reason choosing to put tenants at a political disadvantage. This is unacceptable. Tenants should insist on a two-year extender, to 2017. Check out the Activate blog run by Met Council on Housing. It's got great photos of the May 14, 2015 rally! By Mia McDonald | May 15, 2015. Throngs of tenants rallied in Foley Square, marched over the Brooklyn Bridge (several hundred still coming at 7 PM), and into Cadman Plaza - where they were met by great music. Tenant-supporting electeds were there. The question is whether Governor Cuomo was listening. A tide of anonymous money has flowed into a campaign to stop the project, which Glenwood opposes. Yet its donors have remained secret thanks to a loophole in state ethics law. Proponents of the transfer station see the fingerprints of the real estate giant. "It's been like running into a buzz saw," said Eddie Bautista, executive director of NYC Environmental Justice Alliance. "They hired three sectors of professional hit men – the lawyers, the lobbying firms, the PR firms." Andrew Cuomo finally said something about the expiring rent laws. On April 21, the governor told reporters that both the 421-a tax break for developers and the rent laws covering New York City and Nassau, Westchester, and Rockland counties should be renewed. Both laws expire June 15. Get in touch with your legislators, even if they support tenants and even if you have done so already. Write a letter to Governor Cuomo. Recruit your neighbors. Get on a bus to Albany on Tuesday, May 27 and/or Tuesday, June 9. And show up at your Rent Guidelines Board meetings. The reforms involve the state’s rent-stabilization law and an obsolete tax break for developers. 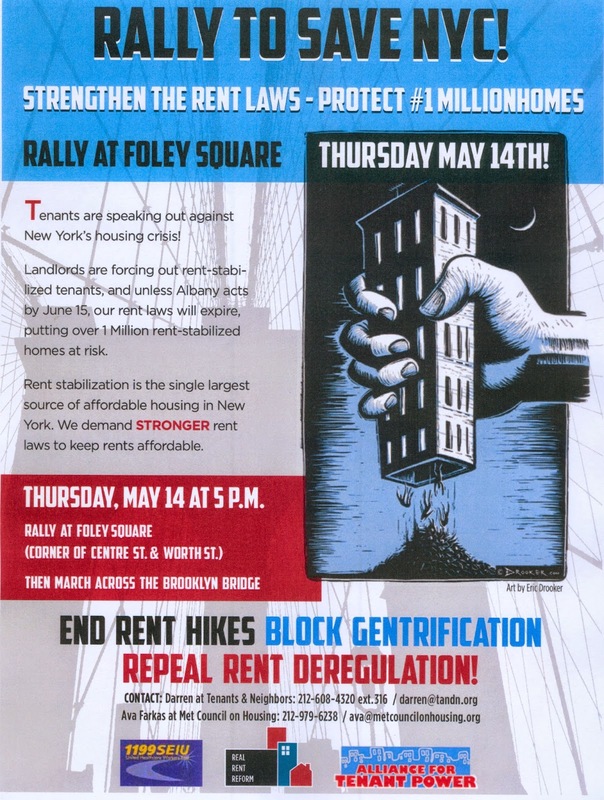 Both expire on June 15, and reforming them is an important goal of tenants’ advocates and of Mayor Bill de Blasio, who has made it his mission to preserve and expand the city’s endangered supply of affordable housing. Click on the link for the full editorial. Gov. Cuomo: Where's your support for stronger rent laws? Increase 421A tax break affordable housing requirements from 20% to 25-30% of units built. 421A would apply to rental housing only (not condos), and the affordable units would stay affordable only for 35 years - not permanently. To the existing 1% sales tax for apartments selling for $1 million or more, add 1% for those selling at $1.75 million or more, and another 0.5% for apartments $5 million or more. End the current 20% rent increase when an apartment becomes vacant. Limit Major Capital Improvement and Individual Apartment Increases so they are not permanent. Governor Andrew Cuomo and Assembly Speaker are positioning themselves for end-of-session negotiations over renewal of the rent laws and the 421-a program. Cuomo is angling for renewing both programs in the current form – exactly what the real estate lobby wants. Heastie says he wants “enhancements” to the rent laws. The three articles below shed light on this early maneuvering. City & State has a good interview with Tom Waters of the Community Service Society (he spoke at one of our tenant association meetings) and Jose Lopez of Make the Road NY. They explain the main issues at stake for the next 6 weeks - before the rent laws expire on June 15th!